In honor of Diana Bober's death from a supposed Cougar attack, please be a part of the healing by funding Oregon Cougar Action Team's Guardian Dog Livestock Protection Program. This program would help our hard-working Oregon livestock farmers by humanely protecting their livestock from cougar attacks. OreCat's guardian dog program serves people seeking safety while living in rural Oregon as the Guardian Dog can also serve as a ‘family protection dog.’ Additionally, the Guardian Dog serves us well as a companion hiking dog for those who love to enjoy the wilderness. This program can also help protect Oregon's cougars and cougar kittens from being hunted down with hound dogs. We learned a lot about Diana Bober's love for nature and large wildcats from her change.org petition participation as well as other websites she referenced. Oregon Action Cougar Team is counting on you to be the change Oregon needs to help protect Oregon's cougars from being hunted down with the use of hound dogs. The Guardian Dog will help Oregonians learn to coexist with their surroundings in the wilderness and on their farms. Holly, from Tons of Noise Farm, is an Oregon breeder of the Great Pyrenees/Maremma Guardian Dog, and she has these puppies available now for families and livestock operations that can appreciate, love, and care for them. They are $400.00 each. This is channel 12 ABC KDRV news coverage on our livestock guardian dog program! This breed of dog is naturally protective and requires very little training. Guard Dogs are great family pets, and they are very protective of livestock and children. Great Pyrenees/Maremma Guardian Dogs are also exceptional hiking companions, and they have a great judge of character. They will bark when there is a risk, but they will stay quiet when they feel all is safe. They’re remarkable! We want to fund three dogs, but our goal is to place twenty livestock guard dogs on farms or in homes. It depends on you for how many small subsistence farmers and families will get the protection of a livestock guardian dog. We want to place these amazing dogs with families in rural areas with the highest cougar populations who could not otherwise afford to purchase them, or for people who want to hike alone in Oregon's fantastic wilderness. With your help, we can make this dream possible. 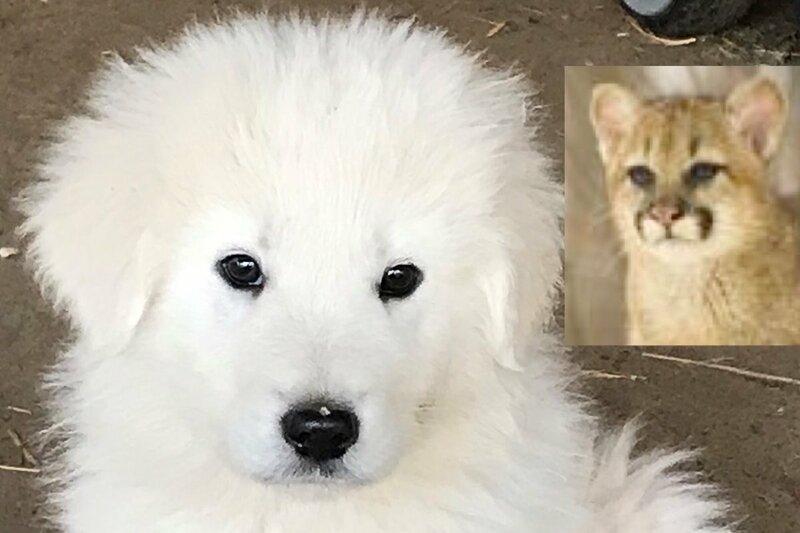 Please unite with OreCat in heart-felt memory of Diana Bober to help OreCat guard all that she loved with a livestock guardian dog for those in need of protection. Thank you for honoring Diana Bober by participating in this program that helps Oregonians protect the heart, soul, and integrity of Oregon's wilderness, our society, our economy, and our cougars. Hosted by Orecat.org a 501c3 educational foundation and members.